We arrived late last night. Tired but happy to be back in Montréal. Ready for tonight at Chapters Indigo. 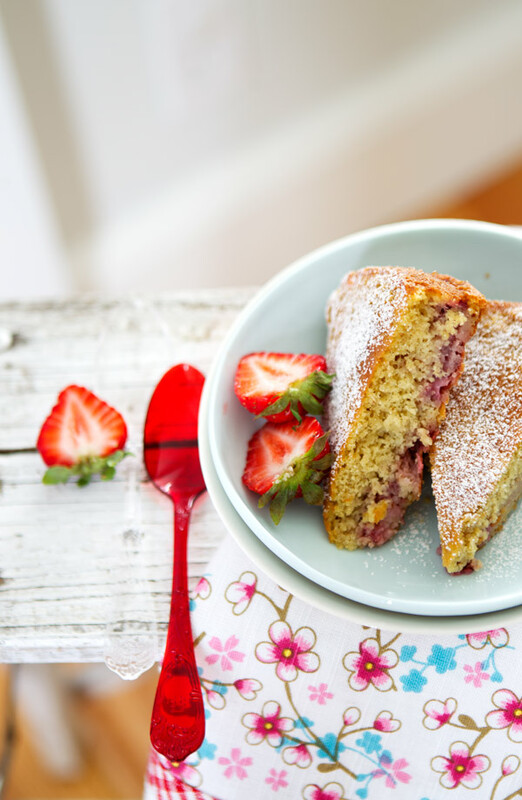 I also realized that I had forgotten to tell you about the delicious strawberry cake I baked right before leaving. Light like a feather! Springy. Nutritious. Not too sweet, but just right. Garrett inspired my recipe (and his was inspired from Deb–isn’t it funny how a recipe can evolve?) His cake recipe made me crave to bake a similar cake for breakfast, but with my own touches and tweaks. And because I had a few slices remaining, I decided to pack them for our road trip yesterday on our way to Montréal. And oh oh, I need to tell you how nice that felt when, by five o’clock in the afternoon, we stopped for a nibble. We sat around a wooden picnic table by the side of the road. It was sunny and the fresh air did us some good. And so did the cake and fresh strawberries I had packed as well. With tea. And now we are settled in a lovely B&B. Hanging out for the day. Mostly resting. Tonight is a special time to meet some of you at the bookstore. And tomorrow morning (Saturday April 21st), I will be on the 8 AM CBC Radio Show in the “All in a weekend” show with Sonali Karnick. I am excited for everything that is happening in Montréal. But in the meantime, bake the cake and enjoy! Update: This is the short interview I had with Sonali Karnick on Saturday. She was so friendly. So welcoming! Thank you Sonali (and especially to my friend Sylvie!) I loved being there. Preheat the oven to 400 F and butter and flour a 9-inch cake mold; set aside. In a bowl, combine the almond meal, millet flour, baking soda, baking powder, and salt; set aside. Beat the butter in a stand mixer until creamy. Add the sugar and vanilla seeds, and beat until smooth and creamy. Add the eggs, one at a time, making sure to scrape down the sides and bottom of the bowl while working. Add the flour mixture and then the buttermilk, and beat until well incorporated. Fold in the strawberries, then pour the batter into the mold. Bake the cake for 30 minutes, or until the blade of a sharp knife inserted in the middle comes out dry. Let the cake cool for 5 minutes once out of the oven. Release the edge with a knife, if necessary, and then flip the cake onto a wire rack to cool completely. When ready to serve, dust with confectioner’s sugar. Préchauffez le four à 200 C et beurrez et farinez un moule à gâteau de 23 cm; mettez de côté. Dans une jatte, mélangez la poudre d’amandes, la farine de millet, la bicarbonate de soude, la poudre à lever, et le sel. Mettez de côté. Battez le beurre en pommade puis ajoutez le sucre et les graines de vanille. Battez jusqu’à ce que le mélange soit crémeux. Ajoutez les oeufs, un à un (raclez les bords du moule en travaillant). Ajoutez les farines puis le lait ribot, et mélangez bien. Ajoutez les fraises et mélangez délicatement. Versez la préparation dans le moule et cuisez le gâteau pendant 30 minutes, ou jusqu’à ce que la lame d’un couteau insérée au milieu en ressorte sèche. Laissez le gâteau refroidir pendant 5 minutes. Passez la lame du couteau sur le bord du gâteau pour qu’il se démoule plus facilement, puis démoulez-le. Tu es chez moi ce week-end mais malheureusement je ne pourrai te rencontrer… Dommage, j’aurais bien aimé. Je vais me contenter de ce superbe gâteau aux fraises. Lovely! Have a great time! Youppi! Je vais essayer d’y aller! Ton gâteau sera mien ce WE, c’est certain. Tu as utilise un moule rond ? 22 cm ? J’adore les fraises et en Californie les bio sont un pur délice. Bravo pour tout ce qui t’arrive. Je te lis et suis tes aventures. C’est magique. Autant que ce blog avec tes recettes lumineuses et colorées qui donnent simplement envie de venir s’asseoir a ta table. Bonne continuation a toi Bea. Bises gourmandes. I guess this is strawberry pies week. Everyone I know are having pies for dessert in their homes. Two days ago I prepared juicy pie with strawberries, raspberries, cherries and currants. thank you so much,and congrats!!! Right now, the book is only in English, I am afraid. Hopefully in French in the future. looks amazing! 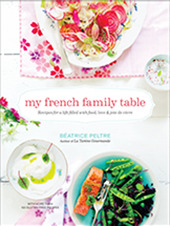 will try recipe this weekend :)) good luck in Montreal and happy book signing! Love that city! Sure you met a lot of great people tonight… I’m so sad I haven’t been there (altought I was having a great great meal in a cool restaurant). If I’m awake, I’ll listen to you tomorrrow morning! Wish you luck For monday, how exciting! Have a wonderful time in Montreal. And thank you for this delicious recipe! Made the cake this morning for breakfast! I did not have millet flour on hand (yet), so used all-purpose flour. It was scrumptious and my husband loved it! He usually does not like sweet treats, but devoured a good portion. Thank you and hope your Montreal travels continued well! Thank you for your kindness and patience while you answered everyone’s questions at the book signing last night! It was a pleasure to meet you. I hope you and your family enjoyed the rest of your stay in Montreal and I wish you all the best in your future projects! I enjoyed listening to your interview on All In a Weekend. Love your cookbook too! Thanks for letting us know you would be on the radio as I listened through the computer. Wish I could bring my cookbook to the signing but Sacramento is a little far to come from. Elizabeth @ The Dapper Paper Co. I am so looking forward to getting your book. 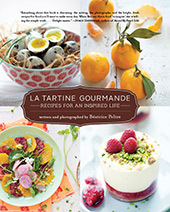 The recipes, the photos, the colors, it’s just so dreamy. I was wondering where you got that colander also? I am in love with the minty color! Thanks so much. I hope you will love the book. Unfortunately, I don’t remember where I bought it! Just ordered my copy of the book. Your recipes are amazing and inspiring! Can’t wait to try them. I love the combination of the rustic fruit cake on that wooden bench. And the bright and fresh colours in the other photos–really lovely. Loved the radio show Béa. Thanks for the link. I heard it from the Dominican Republic. So sad I am not in Montreal right now to meet you. Hopefully you will return back soon. Let us know how was your week-end and how you liked Montreal. Tu a pu aller au marché Jean Talon? C’est LE Marché de Montréal. Les couleurs des fruits et legumes sont très inspirantes. A bientôt j’éspère. I’m a long-time reader but first-time commentor. 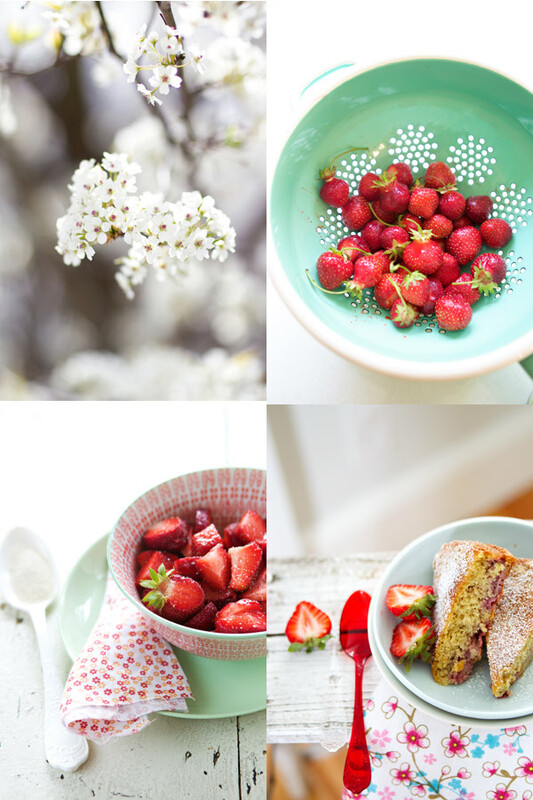 I absolutely love your blog, thank you for all your wonderful recipes! I have a question, Strawberries are out of season here (South Africa) so I was wondering if other berries would work, eg:raspberries, and would I have to adjust the sugar? Nothing like a pit stop on a long trip, thermos of hot tea on hand and home made food. So much nicer than those awful eateries at filling stations. Just get so happy every time I read your blog, as we’d say over here, “真的鸟语花香”. Impatiente déjà de pouvoir lire tes prochaines aventures! Another beatiful recipe! I did not have millet/almond flours so I used quinoa and hazelnut instead – it was divine, I loved the texture. My husband’s only complaint was that it was too small. I don’t know how you do it but all of your recipes turn out just otherworldly. Enjoyed the interview. Baking the cake this week! Tell us more about your garden sometime. We planted ours this week. What a delicious warm breakfast perfect for summer! I love it very nice! Hi! What lovely pictures! This makes me hungry! For sure I will try this cake… Too much color, too much flavor. Honestly, all this is very hard for my waistline, but I can’t resist! oo gluten free, can’t wait to try it! 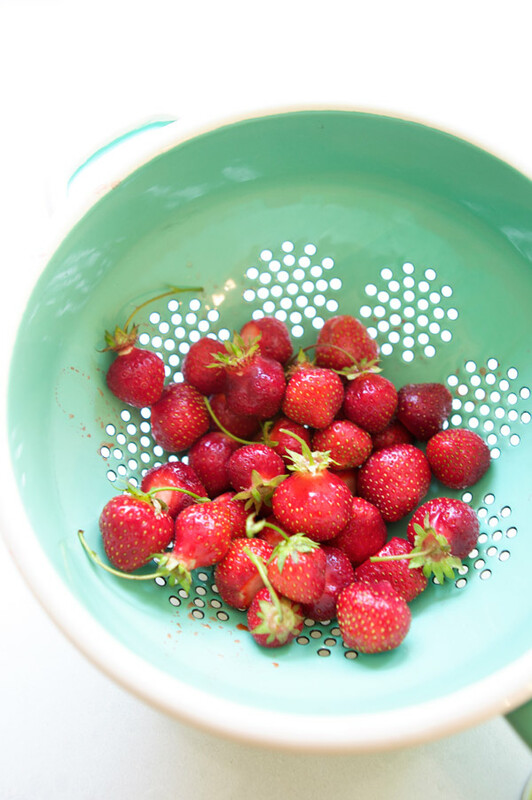 also i love the look of fresh strawberries, so much prettier than the giants sold at the supermarket! hello Bea, very nice blog and wonderful photos!!! Hello Beatrice, a delicious recipe¡¡ I have got your precious book, i love it, and i can,t find xantam gum and I have a question: Can I replace for agar agar? Thank you very much and congratulations for your blog. Many thanks. So pleased to read you like the book. I have not tried to replace with agar agar actually. Another option would be to make a chia seed paste. In any case the recipes work without xantham gum. Only diff is that the crust are a little more crumbly and don’t roll as easily (in which case you have to pat the crust inside a mold). I only use xantham gum in my tart crusts as a matter of fact. And as little as possible. Je publie ma recette de suite et évidemment te cite. Bises gourmandes et bonne continuation à toi. Béa, isn’t this the perfect opportunity for me to finally use my almond meal?!?! Well, I did!! And it’s a delicious cake, very light and flavorful! David absolutely loves it!! Love your new blog style! And this grouping of photos is just so fresh, colorful and happy. Love it! Made this on Sunday evening, AMAZING! I unfortunately did not have Almond flour, for some odd reason it seems to be missing from the markets now, hopefully I will see it soon. Therefore, I replaced it with Dark Rye flour and Brown Rice flour and worked just fine. So pleased that for those of you who made the cake, you loved it. Made this cake for company! It was wonderful. I served it with extra sliced berries and a thickened cream!! Oh my. Can’t wait to make it again. Patti, so glad you enjoyed it. I made this cake to bring some happines to our thursday afternoon. And it did! Delicious and made me wait summer even more! Thanks for the recipe. Just made and ate this cake. Delicious! i am working now,but i really very hungry,may i have one?it looks delicious…. Merci pour cette très jolie recette ! Hello! I made this cake over the weekend and loved it, but subbed spelt flour for the millet because I did not have any. I want to make the cake Saturday for a gluten free friend, and cannot find millet flour — I have been looking for it at all of our local markets without luck. Bea, might you have a suggestion for a worthy gluten free substitute? Many thanks, your blog is beautiful. My grandparents are Sicilian and I really enjoyed that post. Hi Gina, so pleased you like the cake. You can use quinoa flour. They work equally well. Bea, I’ve made this cake twice now and it’s great- partially. The second time I didn’t have almond meal so i used ground pistachios instead, and apricots for the fruit. Question, though: both times I made it, the part of the cake touching the fruit was pretty bitter tasting. I used brand-new baking powder (aluminum-free) and soda both times. What do you think is going on? I really want to make it work because this is my favorite type of cake (=nut flour… fruit… not too sweet…). Hi Cate, I am actually not sure as I never ran into the issue myself. Was it like this when you used almond meal, as suggested? I imagine using pistachios instead of almonds would impart to a much more pronounced taste. I wish I could help more but frankly, I am not sure what the issue is. I’ve so far received excellent feedback from this recipe, so it does not seem to be a recurring problem. Hopefully this will resolve. I’m in love with this recipe. As soon as I get some free time I will try to make it. First of all: I loved the interview! I made the cake yesterday night at 10pm (I was desperately craving for some cake). I didn’t have strawberries so I took nectarines. Unfortunately it turned out that two of three nectarines were gone bad (really odd: when sliced open you could see that the pit was broken so the kernels were “free” and there was some sort of white mold(?) around the inner side of the pit so I wasn’t so sure if they would still be okay to use). This meant that I had only the flesh of one nectarine for use. However I gave it a go and put some roughly chopped pecans into the batter as well. The cake turned out okay but lacked flavour. I’m blaming the single nectarine. The texture was however good and I think I’m gonna make it again – but this time according to your original version. I actually made this and it was beyond delicious! 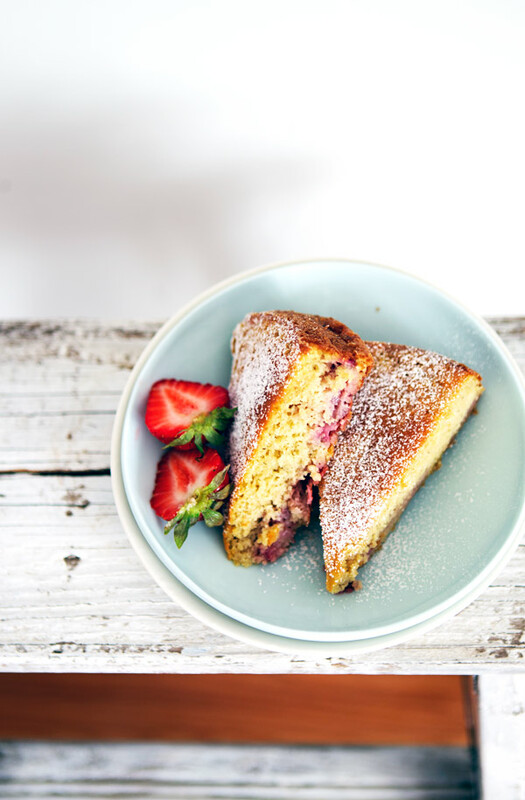 ça a l’air délicieux ce gâteau léger aux fraises … merci pour la recette ! I’m with you, jumping and flailing my arms around over those gorgeous strawberries! This cake recipe is amazing ! Over the past few years I have made it a number of times with a few minor tweaks here and there. Each time it has been great.Today I made it for my husband’s birthday and it was very well received.